(PD) Image: Courtesy of Special Collections, University of Houston Libraries. Schooners are sailing vessels entirely or mainly equipped with fore and aft sails -- in contrast to square rigged vessels, like clipper ships. Schooners have at least two masts. 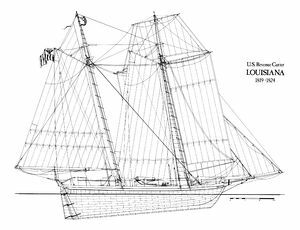 If a schooner has just two masts the rear mast will be at least as large, usually larger than the foremast, and will be called the mainmast. In the last years of commerce by sailing ship some large commercial vessels were equipped with four, five masts which each carried fore and aft sails. The schooner rig required less manpower. This page was last modified 05:54, 27 April 2011.